Last year a female friend invited me to take part in their croning ritual - and it was a very moving experience. You may be wondering, what is a croning ritual? It was described to me as a ritual to mark the rite of passage for a woman who has gone through the menopause. This means it is at least two years since they last had a period and are therefore past their time of fertility. In the three ages of woman - maid, mother and crone - they have entered into the time of the crone. The croning ritual was beautiful. It honoured the life experience and wisdom one gains with age. However, the subject of the menopause is still somewhat taboo in our society. There are great pressures on women to remain young-looking to pretend they are not getting old. People don't talk much about the menopause - almost as though they are trying to pretend it doesn't happen - and the word "crone" itself seems scary. 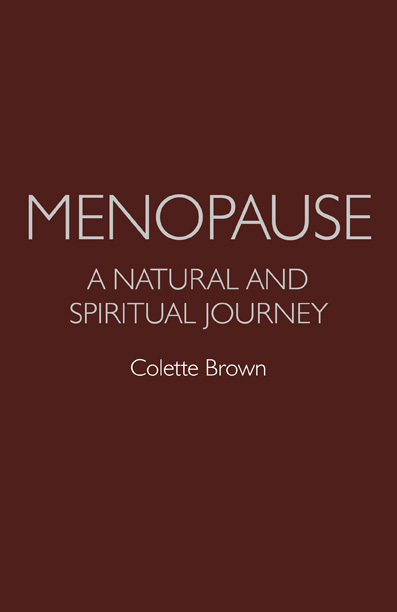 A new book called Menopause: a Natural and Spiritual Journey , written by psychic agony aunt Colette Brown, looks at the menopause as a natural stage of life. It is not a book about what remedies one can take to combat the effects of ageing or the symptoms of the menopause. Instead it is covers a series of meditations suitable for women who are going through the menopause to help them understand the changes that are happening and emerge wiser and happier from the experience. The book discusses the different symptoms that the menopause can cause - such as mood swings and tiredness - and recommends spending half an hour each day meditating on the questions these things bring to mind. Colette recommends specific crystals to hold while meditating and also mantras to say to help see the positive aspects of what is happening. A chapter at the end of the book suggests ways of creating a grandmother ceremony to recognise the power and wisdom of the wise woman. Colette uses the term "grandmother" rather than "crone" because, to many people, crone is a more negative term than grandmother. Publisher Ayni Books says in its publicity material about the book:: "In the past, menopause was a 'hidden' taboo topic with so much negativity associated with it. It was seen as a purely physical process linked with degeneration into old age and ill health. However, with woman living longer it has begun to be perceived as a rite of passage into a new way of living and being, linked with more freedom and energy. Menopause itself can still be very debilitating for many women. This book is personal journey into the time of menopause looking at it from a spiritual point of view first and how spirituality can help with physical, mental and emotional symptoms. It seeks to show it as a natural part of life." Although I myself am not quite old enough to call myself a crone or a grandmother, attending my friend's croning ritual made me realise that it won't be too many years before I face that time of change in my life. Reading Menopause - A Natural and Spiritual Journey has helped me understand what that entails and how it can be regarded as a spiritual journey on the road to becoming a true wise woman, which is the essence of the crone. Menopause: a Natural and Spiritual Journey is published by Ayni Books and can be ordered through Amazon. Hi Wiccan Pope, If you want to send me a press release about Wiccan Pope I would be happy to consider posting something about it as a blog entry if it seems suitable. WiccanPope.com is a Monotheist Wicca Site. Supporting the belief in One God. The Lord Hunter God Jehovah, and His Consort, the Goddess Wisdom. Together, in marriage, They are One God. As the first man and his wife were one in marriage. We believe in order to save the condemned spirits in hades, the Birth Mother Goddess possessed, and became the Christ of the Jews. Monotheist Wiccans are Jehovah Disciples or Je.di. for Short. The Jehovah Disciples support Family Naturism, and Monogamy. The Je.di. do not wish to convert those who choose not to believe. However, we intend on keeping the Monotheist Witch's beliefs alive. So if you are willing please post a link to WiccanPope.com, to express not necessarily your belief in the Je.di. religion, but your belief of the Freedom of Religion.